Your Children’s Dentist Is Excited About Children’s Dental Health Month! February is National Children’s Dental Health Month! This annual campaign to promote good oral health in young ones began in the early 1940s, and since then it has grown into a nationwide effort to help our precious kids have beautiful, functional smiles that last a lifetime. Your children’s dentist in Carrollton is excited about February and is here to encourage you to get into the spirit of this important event. Here are some ideas for how you can help your kids achieve a healthier mouth. It enables your dentist in Carrollton to spot issues with your little one’s dental health while they’re still in their early stages. Seeing a dentist regularly may alleviate some of the nervousness your child feels when it’s time for an appointment. They may grow up to be free of the dental anxiety that afflicts so many adults. Let’s face it — children don’t always listen to their parents. However, they might listen to the cool dentist who tells them to brush and floss regularly. Some parents go by the “Do as I say and not as I do” model of raising children, but it’s better to show by your actions how your kids should act. Therefore, February is a great time to pay more attention to your own oral health. Brush twice a day, floss daily, and try to cut back on foods and drinks that you know aren’t good for your pearly whites. Let your kids see your efforts to improve your oral health, and explain why you’re doing the things you do. Your whole family can get enthusiastic about oral hygiene together! You don’t just want to hammer it into your child’s head that oral health is important; you want them to understand why it’s important. You can search the internet and find some short age-appropriate videos or photographs that shine a spotlight on what can happen if habits like brushing and flossing are neglected. You can also give them some hands-on training to help them brush thoroughly (for example, they might sometimes forget to brush the backs of their teeth) and floss properly. Your children might be more likely to love caring for their teeth if you put a little fun into the mix. Why not let your kid pick out their own toothbrush (lots of children love electric brushes)? 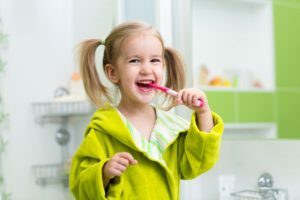 You could also plan a fun family outing for after your child’s next dental appointment and offer small rewards for when your little one is trying their best to keep a clean and healthy mouth. Many people see February as the month of love, but it’s also the month for focusing on children’s oral health. Do your part to help your kids achieve beautiful, strong teeth. The doctors and staff members at Celebration Family Dental love to care for young smiles. If it’s time for your kiddo’s next appointment, or you have concerns about their oral health, please contact us at 469-892-6647. Comments Off on Your Children’s Dentist Is Excited About Children’s Dental Health Month!